What do you do when it’s cold and snowing outside? 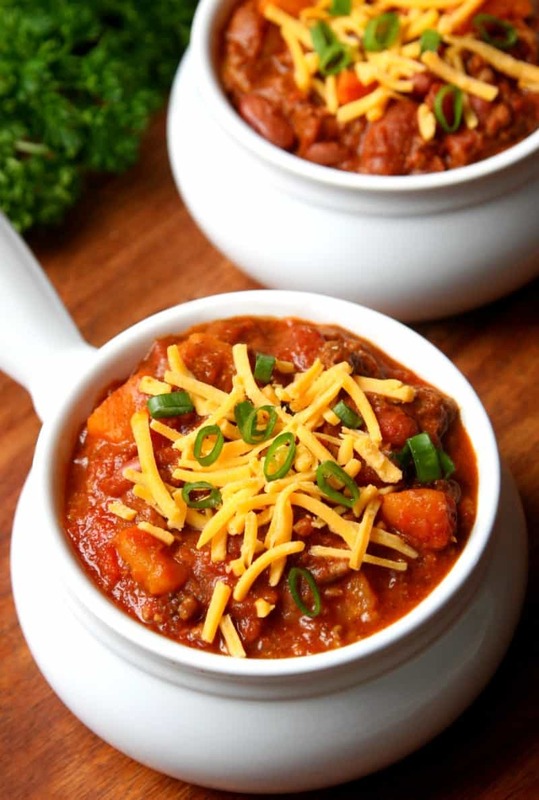 You make Turkey Sweet Potato Chili! 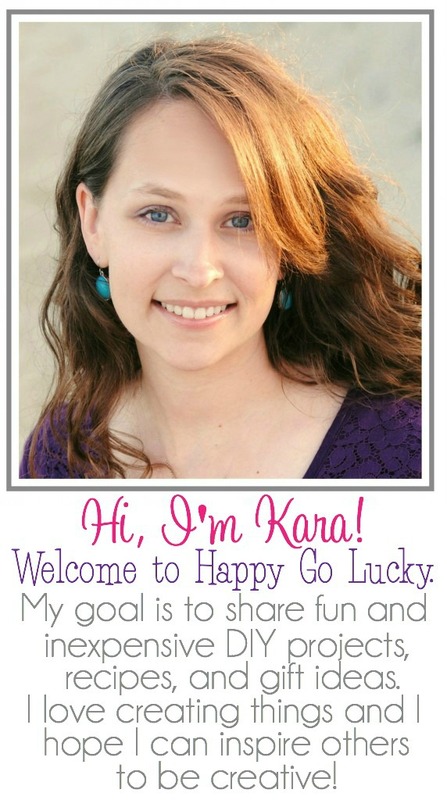 A delicious chili loaded with spices, ground turkey, chunks of sweet potato and so much more. It snowed ten inches here over the weekend which is a big deal for Virginia Beach. This much snow causes the entire city to shut down and that means two thing for us – we get to stay in our pajamas all day and my husband makes his famous chili. This Turkey Sweet Potato Chili is the perfect snow day recipe. 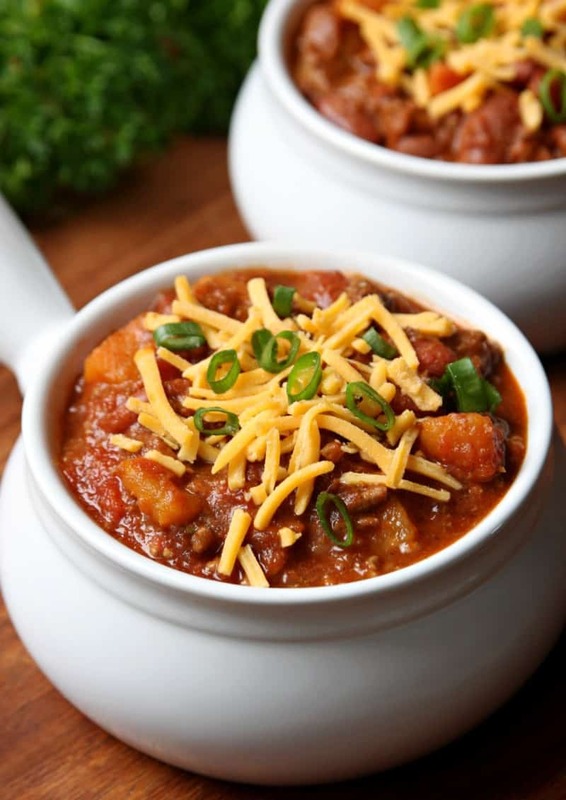 Top it with your favorite chili toppings for the best chili ever! 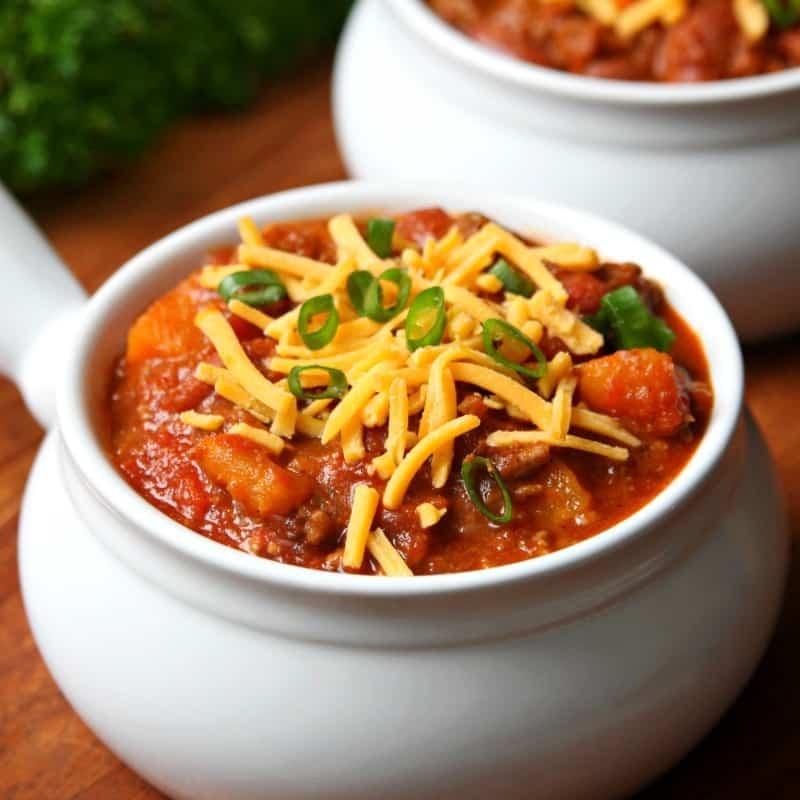 He calls it his famous chili because he won a chili cook-off contest at work with this recipe. And, although that was about 6 years ago, I still hear about it all the time. But, hey, I’m not complaining because this means I don’t ever have to cook chili again. All I just have to do is buy all the ingredients and dinner is made for me. Can’t beat that! 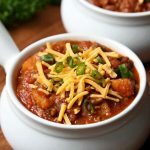 This is my all time favorite chili recipe! I love the addition of sweet potatoes with the ground turkey. I always used to add rice to my chili but now there is no need for that. This recipe is so easy and you can cook it on the stove or let it simmer all day in your slow cooker. It really is the perfect meal for a cold, snowy day. Don’t be intimidated by the long list of ingredients in this recipe. I know when I see a list of ingredients that long, I usually look for something easier. But, you probably already have most of the spices in your pantry and if you don’t, now’s the perfect time to stock up so you can make this chili all winter long. You can always buy two chili packets at the store if you’re on a budget and don’t want to buy all the spices. So, now it’s time to enjoy a bowl of Turkey Sweet Potato Chili with a glass of wine on this lazy snow day. Which brings me to one last question – what are your favorite chili toppings? Heat olive oil in skillet. Add turkey, onion, green pepper, garlic, salt and pepper. Cook and stir until turkey is no longer pink. Stir in chili powder, cumin, red pepper flakes, onion powder, and thyme. Transfer ground turkey to slow cooker or large pot. Add sweet potatoes, beans, tomatoes, tomato sauce, beer, and honey to slow cooker or large pot. Cover and cook until potatoes are tender – about 3-4 hours in slow cooker on high, 5-6 hours in slow cooker on low, and 30 minutes over medium heat on stove top. Serve warm with your favorite chili toppings.